Randy Browning Keeps It Simple, Uses The Data, Makes Money! A couple of years ago, we featured one of Gardiner Angus Ranch’s good customers, Randy Browning. Commercial cow-calf producers, Randy and his wife, Sharon, Appleton City, Missouri, have kept detailed records on 38 pens of retained ownership calves spanning 16 years. 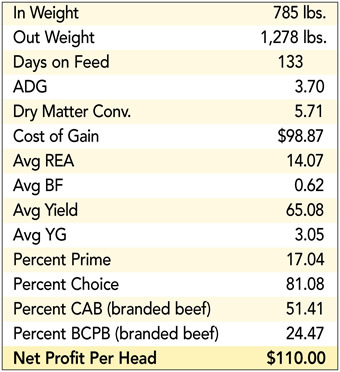 An analysis of Randy’s previous reports document the value of improved feedlot performance as well as premiums earned above cash market at the packer. His 2012 closeout is even more impressive. Forty-six steers and 11 heifers went on feed at Midwest Feeders, Ingalls, Kansas, in early 2012. The cattle were fed for 133 days and processed at National Beef, Dodge City, Kansas. Randy understands the value of using the data to make genetic improvements. He keeps good records, uses the data to evaluate his genetics and make sound management decisions. As every good commercial cowman knows, the bull is only half the genetic equation. Randy rigorously culls his cowherd annually and the result is improved maternal efficiency while simultaneously improving the overall carcass quality of the herd. We thank Randy for sharing his data with us. More importantly, we appreciate our many customers like Randy Browning that embrace technology, use all the data and focus on the fact we all can efficiently produce high performing, high quality beef for every segment of the food chain.